The Beovision 3000 was the first production B&O colour television set. The technology it employed was typical of the first generation of European colour receivers generally, using a mixture of valves and transistors. The tube was made by Philips (type A63-11X) and had a 90 degree deflection angle and a “delta” type gun arrangement. Text copyright © Beocentral. Unauthorised reproduction prohibited. B&O resisted the temptation to be the first to the market with a colour TV set and decided instead to launch a fully developed product a little later. This policy paid off, the refined design proved to be reliable, easy to use and capable of excellent results. Some manufacturers were clearly stretched to the limit to produce a set that could simply put a colour picture on the screen but this was not the case for B&O, whose design included various refinements to ensure maximum viewing pleasure. Text copyright © Beocentral. Unauthorised reproduction prohibited. To ensure a stable picture, the Beovision 3000 employed a separate line output stage and high voltage generator. This unusual technique had been abandoned in domestic receivers years before in the interests of economy but in truth was the only way to keep the picture size and shape absolutely steady under all conditions. The high voltage generator was stabilised further by two separate systems against long term drift and transient loading, though it did not rely on a bulky, wasteful and dangerous “shunt regulator valve” that was a common fitment in other manufacturers’ colour receivers of the period. Freed of the need to produce the high voltage, the line output stage could be made to an excellent design that included geometry correction applied to the driving signal (to ensure a square picture with straight edges) rather than to the output, resulting again in first class performance. Text copyright © Beocentral. Unauthorised reproduction prohibited. Similar techniques were applied in the vertical circuits which were capable of almost perfect linearity and were stabilised against the effects of aging valves. The convergence circuits (necessary for the delta-gun tube) included a full range of controls and were powered from a regulated supply, an arrangement that was claimed to reduce the effects of mains voltage variations. Text copyright © Beocentral. Unauthorised reproduction prohibited. The PAL decoder, a complex part of any early colour receiver, used transistors throughout. These were operated at an unusually high voltage so that large signals could be handled correctly and without distortion. The output of the decoder was presented to the tube using the “colour difference drive” method where a high-resolution monochrome picture was mixed with three colour difference signals by the picture tube itself. This part of the circuit used 8 valves, four of which formed accurate “clamp” circuits that kept the colour balance constant regardless of the overall scene brightness. The valve that provided the monochrome picture signal was a special American type (RCA 12HG7) that was imported specially, as it gave slightly better performance than any European alternative. Text copyright © Beocentral. Unauthorised reproduction prohibited. Finally the sound section, often an afterthought in any television, was a proper Hi-Fi design with a sophisticated transistorised preamplifier (which featured treble and bass controls) and a valve output stage. This fed two large loudspeakers in the bottom of the cabinet. Text copyright © Beocentral. Unauthorised reproduction prohibited. The result of all the technical refinements and attention to detail in the design of the Beovision 3000 resulted in a set that gave similar results to a studio monitor of the period. It was certainly capable of outperforming any other domestic set of the day, and although expensive (like all early colour TV sets) it did not cost that much more than the top-line models in other manufacturer’s ranges. Text copyright © Beocentral. Unauthorised reproduction prohibited. 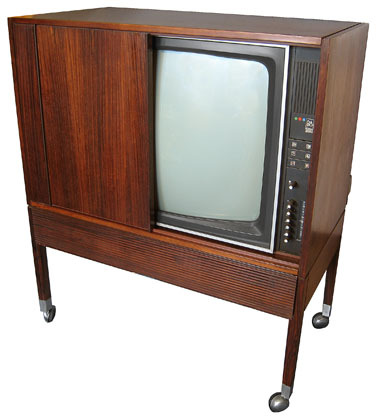 The Beovision 3000 was physically a very large set, the 25” tube and the two substantial chassis made sure of that. The designers did well to house all the working parts in a neat and presentable cabinet, which included a sliding door to hide and protect the screen when the set was not in use. To the right of the screen were the user controls, kept as simple as possible so as not to discourage people. A clever trick of grouping the minor controls together in pairs and concealing them in little pop-out drawers was used to avoid cluttering the panel with lots of confusing knobs. To the left of the screen was a removable panel behind which the convergence controls for the tube were hidden. These would normally only be used by an engineer and many owners were probably unaware that they were even there. Text copyright © Beocentral. Unauthorised reproduction prohibited. The Beovision 3000 was a successful and well respected entry into the field of colour television by B&O. It was replaced by the Beovision 3200, a similar model with a few minor updates. Text copyright © Beocentral. Unauthorised reproduction prohibited.